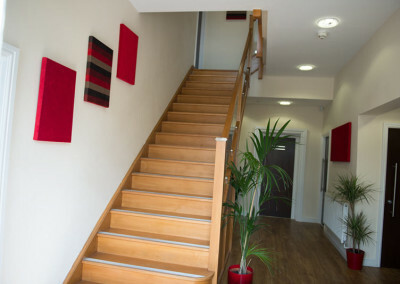 Following a £500K refurbishment, DBS opened The Old Police Station in Ashby de la Zouch. The period building is in the centre of Ashby and is therefore surrounded by local amenities. The business centre offers both individual and interconnected office suites, thus perfect for businesses needing 1 workspace or 30! DBS Ashby is located just behind the main street and is easily accessible and private. Ashby businesses can benefit from designated car parking and/or low-cost parking in the extensive facilities adjacent to the building. Ashby has seen an increase in business and as such, has grown into a vibrant business community in recent years. If you’re considering a move to a central, modern Midlands location, then DBS has the flexible and affordable office space to help your business grow. Ashby offers semi-serviced workspace through units of varying sizes. Choose from single, large open-plan, or suite of offices – because our Ashby Centre is the perfect solution for all businesses. DBS Ashby businesses also benefit from breakout space and outdoor communal seating. Most importantly, the semi-service arrangement acts as an intermediate between fully serviced offices and traditional leased space. Therefore Ashby clients have the flexibility and minimal commitment of serviced office contracts, as well as the independence for sourcing their own IT/Telecoms providers. Utilities such as gas, electric, water and business rates are included in the monthly rental. Clients also have the advantage of modern IT/Telecom infrastructures already in place (IT & Telecom packages available from DBS Offices). High tech security systems are also in place to connect to, if needed. With electronic door entry and call points in each office, clients have a self-contained yet professional office base to invite clients to, supported by the dbs team. Ashby de la Zouch borders Leicestershire and Derbyshire and is central to the East Midlands. Hence, Ashby also benefits from accessible transport links to and from Burton on Trent, Swadlincote, Birmingham and Coventry – with convenient access from the M42. Ashby is a thriving Market Town with an abundance of period buildings, housing, shops, bars and restaurants, the length of Market Street. Consequently, Ashby is becoming an ever increasing thriving business location. In short, DBS Ashby is the perfect location for businesses who want to grow!